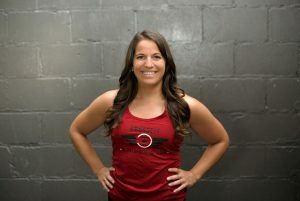 I was first introduced to CrossFit in the midst of marathon training. With a strong background in running and yoga, I was looking for a form of cross training to add to my routine to help build strength. I enjoy staying active and learning new things, and I found the new challenges offered through CrossFit to be both humbling and rewarding. I quickly fell in love with the community, and continue to feel fortunate to be surrounded by so many inspiring and supportive coaches and athletes. I CrossFit because… I like to challenge myself both mentally and physically. I love that CrossFit incorporates a variety of functional movements that allow you to identify both your fitness strengths and weaknesses. I believe being able to celebrate our strengths and acknowledge and work on our weaknesses is ultimately what makes us stronger inside and outside of the gym. I coach because… I love working with people and empowering them to reach their true potential. It is inspiring to watch my athletes push themselves and accomplish their goals in the gym. And seeing this new confidence carry over into other parts of their lives is extremely rewarding.